This entry was posted in Favorite Perfumes, Single Note Exploration and tagged rose, rose perfumes. Bookmark the permalink. and I would happily accept entrance into the draw…who doesn’t love chocolate :) ???? Great! PHI deserves a good company. Thank you for joining the project! Come back and report if you find anything else to wear that fits the theme. Feb 24-28 I will wear a Jo Malone combo of Red Roses and Peony & Blush Suede. I wanted to wear my full bottles for this project which is why I am sticking to one scent per week. I like your plan though for me it would have been hard to stick to one perfume for the whole week: I’m so used to switching every day that even wearing the most loved perfumes that many days would feel restrictive. But I hope it works for you. I really like this idea!! Even though I’m not sure if I could pull of the whole month of roses, or any other note for that matter, not even my favourite – vanilla! January has sort of been a month of roses for me, as I wore a lot of roses, sampling that is. Rose is a note I struggle with, and for the longest time, I couldn’t find any that would suit me or that I’d want a FB of. Last year, when I did most of my roses sampling, I sort of concluded that it’s not for me and I should move on. But my wardrobe really needed a rose, I haven’t a single one. So this year, I started all over, with some I skipped the last time, and I had so much more luck. Either my tastes have evolved, or I have finally figured what kind of roses suit me, so I sort of did targeted sampling unlike the random/any rose one I did before. Lo and behold my first ever rose perfume bottle is on it’s way to me! And it’s February! So I guess that is quite convenient for your project here, as I’ll be wearing a lot of roses this month too, both the one I bought and some new that I’ll be getting samples of this month. I have tried most of the roses in your calendar, but there are still a few I must try too. I love your list,and the ones you have FB’s of are truly excellent! I’m curious to hear what perfume you’ve got once you actually get it and start wearing. Please come back and tell more about what roses you test or wear. I have sampled roses pretty randomly, as in – anything rose dominant. I like the smell of roses in nature, it’s not my favourite smell of all, but I do like it. But for some reason, I had no luck with perfumes. Or it’s too powdery, too sour, fruity, fresh, retro smelling (vintage and classics don’t work for me) etc. But I had a pretty clear image in my head on what I’d want that rose perfume to be. So, the rose I got is Rose Oud By Kilian. Haven’t started wearing yet because I have a horrible virus infection and can’t smell anything. It is not exactly the rose I had in mind, closer to my image would be Rose d’Arabie and I hope to have that one too, at some point. But this one sort of snuck (sneaked? -I’m not a native english speaker) up on me and it’s so beautiful, like no other rose I’ve smelled. So here it is, finally! I’ve learnt that I love darker roses, paired with oud,where oud is polished and not barnyard-y. I love them slightly gourmand,like dipped in honey etc. Something rich, deep and sweet. And without geranium, if I smell even a drop of geranium in there, the deal is off. As for Jo Malone, I haven’t had much luck so far, as my skin eats perfume and these generally have poorer longevity so there’s an issue I couldn’t surpass. But I’m interested in Velvet Roses&Oud and the latest, Myrrh&Tonka. Allright dear, this got lenghty so I’ll wrap it up here! I plan to wear Rose Oud from the sample that I have. I like it but probably not enough to go for a bottle. In general, I have complae relationship with agarwood: I do not like it in most perfumes (though By Kilian Amber Oud is one of my favorites). If you haven’t tried it yet, you should try Velvet Rose & Oud – both the perfume and the body oil. Oh what fun! It doesn’t take much to encourage me to join in such a venture, for rose is probably my favourite floral note, just as vanilla is my favourite base ingredient. I could add PG Brulure de Rose to the pot, though I have something on today already. I have also worn Rose Kashmirie by Les Parfums de Rosine a few times lately, so can wheel that out again. Feels very apt for winer. My Snow Rose bottle went off, so can’t include that. Thanks for giving us a rosy kick start! You got me worried: the sample of the Snow Rose that I planned to wear since I liked it when I sampled it before, came from you. If your bottle is off, I’m out of one day wear and will need to figure out an alternative. I liked PG’s rose and drained my sample completely. Too bad it’s not available somewhere in a store close by: I would have ended up with a 30 ml bottle. Come back and tell more about perfumes you end up wearing. I am sorry about Snow Rose if you have the same experience. It’s discontinued too. If I had fewer bottles overall I would rebuy Brulure, but I can’t justify any FB purchases when I have so much that will also turn if I don’t get to it in time. So far I have worn Parfum Sacre, Divine Spirituelle, and Aftelier Wild Roses. Parfum Sacre is a beaut. Wish I had more than a few ml left. I know what you mean about bottles turning. I’m trying to use my favorites as much as I can (and share some too). But I have the following “rational”: I do my best trying to buy the smallest official bottles available and I store them properly – so the spoiled perfumes are on their manufacturers’ conscience. I really enjoy challenges like this as it inspires me to wear some oft-neglected scents. Today, I am wearing Dior’s Miss Dior Cherie EDP (200?) from a coffret of minis that I bought at duty free in Paris on my very 1st European jaunt ( 2010). Thank you for sharing (and for joining the challenge). Perfumes might have a very strong bond to some things in our memory – and it’s great when those memories are sweet – even if that is bitter-sweet. This is a wonderful idea. I don’t have enough in the way of rose perfumes to participate for a whole month, but I’d like to participate a little bit — the 4 days up to/incl. Valentine’s is about all I can manage. It’ll be Balenciaga Rosabotanica, Lush Imogen Rose, Crabtree & Evelyn Rose Pineapple, and Miu Miu L’eau Bleue. Four days will work perfectly! When you wear those, please come and tell more: I’m not familiar with any of the perfumes you plan to wear. If you happen to publish a review for any of them on your blog, I always encourage linking. This is a lovely idea! And yes, it feels very appropriate for Valentine’s Day. I don’t own enough rose-centric perfumes to fully follow along, but maybe this will inspire me to take a closer look at some of the rose scents we carry at work. Nirvana Rose from Elizabeth & James has been popular lately, so perhaps I’ll start with that one. Yay! You do not need to follow along – any participation is great! Anyway, either come back as you go through the perfumes and tell or share a link if you do a post. What a lovely idea. I don’t have 28 rose perfumes but will happily rotate.. Today Ce Soir ou Jamais! Rotation works as well! Thank you for joining us! I don’t know how it happened but I’ve never tried Ce Soir ou Jamais – even though I like Annick Goutal. I blame local stores that stopped carrying the brand! Day 2 – Fiile de Berlin! I smell great!!! Unfortunately I have drained my Mohur sample so that cannot feature this month of roses. My Mohur sample is almost done as well. But it served its purpose: I enjoyed wearing it, and now I’ll need to think if I want that bottle. I like your choice for today and will also be wearing FdB – tomorrow. (If you run out of nested comments, just start a new thread). Woo hoo! I am joining you and Lucas for a Month of Roses! Today was NVC Mohur Extrait! Beautiful perfume (and such an attractive bottle – I might just give in and buy it once my sample is gone). I’m glad we’re doing that. We could have come up with some more elaborate project but I’m glad it did happen – even if that spontaneously. I love roses :) I will join as much as I can! Does wearing a swipe or two of Tauer Rose Oil every day count? Today, I discovered that the rose body oil layers very nicely with Lonesome Rider. Also, you smell amazing! I’m in! Lovely idea and it’s cheering me up already. Missed yesterday as I’d already applied Cuir de Lancome but today I’m wearing Tobacco Rose. I think I’ll wear it until the 7th but if that changes I’ll check back in. I’m going to go through my samples/decants this weekend to see what roses I can dig up. Well done on your awesome calendar of 28 roses. Tobacco Rose that I also plan to wear this month is a sample that, I think, I got from you. It was harder than I thought to come up with 28 perfumes because I didn’t want to stretch what perfumes to consider suitable for the project. But I managed to do that (I hope – if I find a replacement for the possibly spoiled Snow Rose :) ). Great idea, Undina. To test and use up samples and decants as well. I am in! As you probably know I am quite fond of Rose centered fragrances. I was a little too late yesterday but managed to apply Le Labo Rose 31 body lotion in the evening. Saw on your list you have Rose 31 as a fragrance and own a full bottle. On my skin it is quite masculine but I Have used the body products the fragrance might be different. Have you tried the body products of Rose 31? What do you think of Rose 31? Today I sampled Amouage Lyric for men and woman both of them. Lyric Woman is confusing for me as I really like the drydown but I do not like the way it smells in the beginning. Loved Lyric men in the beginning but not the drydown. I have tried Lyric Woman many times but do not think I will buy a bottle, will use up the decant first. This evening I will probably spray Paul Smith Rose lavishly ;-) Nice choices for this months on your list! Quite inspired to dig up some neglected rose scents as well. I rarely use scented body lotions: not because I do not like them but mostly because I rarely wear the same perfume even twice a month – so it’s completely impractical to have matching body lotions. Perfume doesn’t smell masculine to my nose but it is supposed to be a masculine rose – so your impression might be more precise than mine. Wearing Chanel No. 5 Body Oil today. This No. 5 version has no aldehydes, so the rose and the jasmine both shine through. Chanel No 5 perfume doesn’t work for me but now I’m curious: maybe in that version it might? If I do not find a substitute to the perfume that I might have to replace, maybe I should consider giving myself another chance with No 5? The Cookie Queen is nuts about the No. 5 Body Oil and says it lasts and lasts. It might be a limited edition but not sure. Oh, cool. Last spring/early summer I did wear a lot of roses, and for some reason found the experience very comforting and healing (something I was desperately in need of at the time). 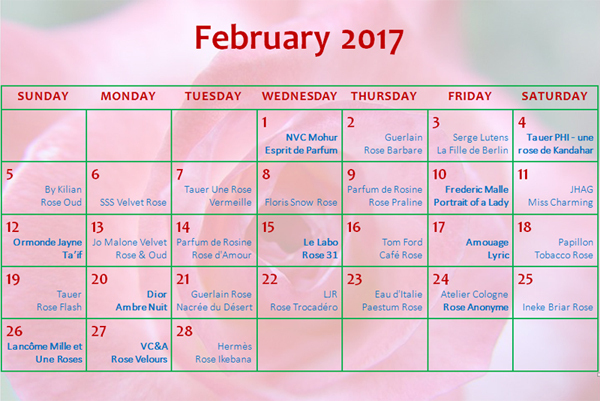 I can’t start until I get home from this trip late Saturday, but I will jump in and commit to spend 21 days of February in rose scents. Deal? Sure!!! I know, it shows my age – both in blogging and human years – but I miss “good ol’ days” of joint blogging events. I love this idea! I wish I had enough varying Rose perfume to indulge. Maybe next year – a goal! Wonderful selection! Doreen, you don’t have to do 28 days/different perfumes. Do it once a week or couple times during the month. Participation is the goal, not the quantity. Lancome Mille et Une Roses! A beautiful blue (!!!) rose courtesy of our swaps! I wore 3 sprays and it lasted about 6 hours. I’m pretty sure I can up it by 2 more spritzes and not be asphyxiated! Hi all: I saw your post, Undina, about Rose Ta’if by Ormonde Jayne. I dug out my sample, tried it and LOVED it. Wow. So different from a Mai rose and in a good way. Ta’if Rose smells a bit metallic on me, again in a good way. I love the saffron and amber. This is a winner and I need a full bottle of this beauty! I’m glad you liked it! It’s such a beautiful rose! I recommend subscribing to OJ’s newsletter: at least 2-3 times a year they have short (1-2 day) sales when they offer 15-20% off their perfumes. And their travel sprays (set of 4 x 10 ml) are not much more expensive than the 50 ml full bottle. Thanks for the recommendation. I am on the OJ newsletter list and i got Frangipani when Ormonde Jayne had a great offer earlier in 2016. For the next sale or free shipping worldwide offer I’ll be getting the Ta’if Rose. I had considered the smaller travel size bottles. Those are great! Also, your kitty is beautiful! What a fabulous array you have.